A Toronto man is fighting back after Air Canada failed to honour a deal to compensate him with an $800 voucher for giving up his seat on an overcrowded plane. An air passenger rights advocate says broken promises are "not uncommon" in the airline industry. A Toronto man is fighting back after Air Canada failed to honour a deal to compensate him with an $800 voucher for giving up his seat on an overcrowded plane from Vancouver to Toronto — instead, emailing him a promotion code for a 15 per cent discount on a future flight. 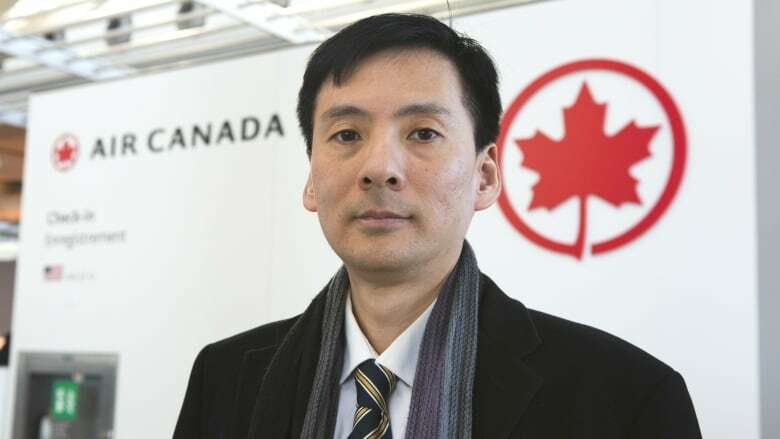 Daniel Tsai said he couldn't believe what he was reading when he opened the Air Canada email offering the discount instead of the airline's previous $800 offer. "It was like reading a Donald Trump tweet," says Tsai. "It didn't make any sense. Just bafflement. And, yes, I was angry." An air passenger rights advocate says airlines renege on verbal promises, because the airline regulator isn't cracking down when passenger rights are violated, and proposed rules don't address compensation for people who voluntarily give up their seats. "I generally recommend passengers not volunteer to give up their seats, because we hear too many cases like this one, where passengers have difficulty in getting compensation they were promised," says Gabor Lukacs, founder of Air Passenger Rights. Tsai visited family in Vancouver over the Christmas holidays, and was scheduled to fly home to Toronto on the afternoon of Jan. 4. When he checked in at an Air Canada kiosk at Vancouver International Airport, he got his first inkling something might be amiss. A prompt on the screen asked whether he'd be willing to voluntarily give up his seat. 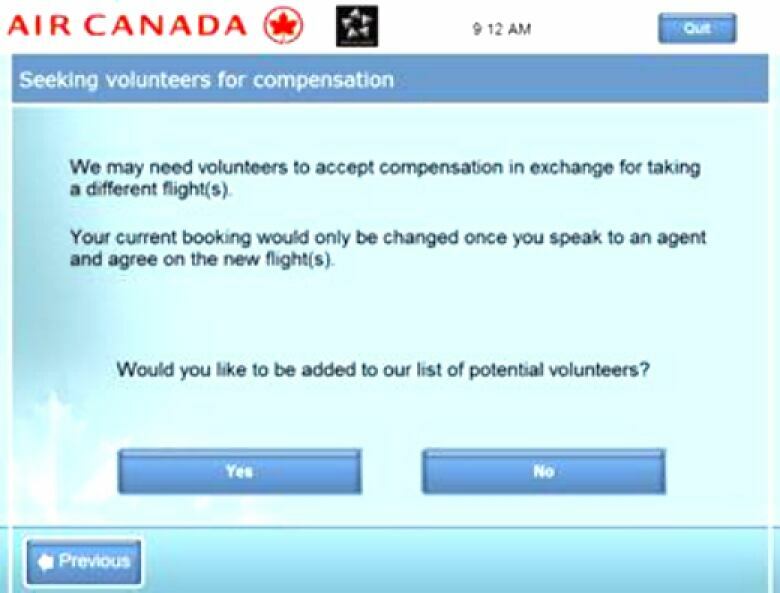 A prompt similar to this one appeared on the kiosk screen when Tsai checked in for a flight from Vancouver to Toronto. "I didn't really think much of it until I got to the gate," says Tsai. "It was just pandemonium. There were people sitting on the floor. There were babies crying. It was a miserable experience." Tsai says he didn't have a pressing need to get home, so he approached a gate agent, and volunteered to take a later flight. "I wanted to do something nice and help a family get home that night. I thought, you know, I should step up and do this." Tsai says an agent initially told him he'd get a $600 voucher in exchange for taking a later flight, to which he agreed. As he boarded his rescheduled flight six hours later, he says a gate agent turned her screen to show his file, pointing out a note saying that he would be compensated with an $800 voucher. The next day, instead of the voucher, Tsai got an email from Air Canada offering the 15 per cent discount on a future flight. He wrote back to the airline, pointing out that the deal was for an $800 voucher, and that's what he expected to receive. Air Canada replied, acknowledging that Tsai had indeed been offered an $800 voucher, but claiming he had been "moved to an earlier flight," so the 15 per cent discount stood. Tsai denies he was moved to an earlier flight, and provided his boarding passes, which showed his new flight was scheduled to depart more than six hours later than his original departure time. The Air Canada email said the airline was offering $300 for future travel as a "goodwill gesture." "I think that's just wrong," says Tsai, who is a business lawyer and part-time professor at Humber College Business School, where he teaches business law and marketing. "As a business professor, I consider that to be a marketing fail," he says. "I give Air Canada an F."
Another law professor — and expert on contract law — agrees that Air Canada needs to be schooled on customer service. "Certainly this feels a bit like Contract 101," says Michael Geist, who works at the University of Ottawa. As a regular Air Canada customer, he says he often hears the airline make announcements asking people to voluntarily give up their seat. "The airline offered up compensation, the passenger accepted it. It's not open to the airline to say, 'Well, we don't really like that deal anymore and so we'd like to change it.'" Geist says he's "perplexed" that Air Canada didn't honour a verbal promise, which was noted in Tsai's file. "Perhaps you have a company that thinks that passenger is unlikely to fight back and will be satisfied with whatever they offer," he says. "The notion that an airline wouldn't stand by what they promised, I think, is damaging to their reputation." Go Public requested an interview with Air Canada to discuss why it didn't honour its deal with Tsai. The airline declined, sending a statement that did not address why it didn't make good on its promise. Instead, it explained that the flight was overbooked because the original plane had to be substituted with a smaller aircraft "due to an operational issue." When Go Public asked what the "operational issue" was — whether it was mechanical, safety, staffing, or a case of not selling enough tickets on the larger plane and deciding to use a smaller aircraft to save staffing and fuel costs — the airline did not respond. After Go Public contacted the airline, Air Canada emailed Tsai again, increasing its compensation by $500. The email did not explain why he was receiving the new offer. Lukacs says his passenger rights organization has heard from other travellers on various airlines who were promised things at the gate that didn't materialize. "It may be a promise for a hotel or meal vouchers by one agent — and then being refused by another agent, and being refused by the company's customer service," says Lukacs. "It's not uncommon, unfortunately." He says Tsai's case is a prime example of a passenger being misled. "This was sheer wrong," he says. "Air Canada got the passenger's seat in exchange for an offer for $800 in vouchers. Therefore, that has to be honoured." Even though Tsai finally got the $800 compensation he was originally promised and a 15 per cent discount on a future flight, he's calling for the creation of an external watchdog that would make sure airlines inform passengers about their rights, and let them know where they can file complaints to get justice. 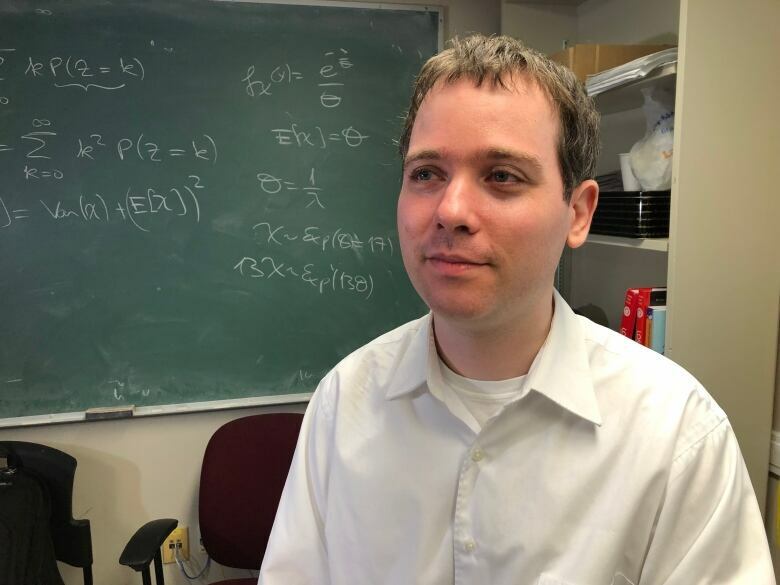 "The odd thing is, I'm a law professor and I had to spend several hours researching this topic myself to find out what I had to do," he says. The business professor has turned his Air Canada experience into a lesson for his Humber College business students. He has created a PowerPoint presentation about how corporations handle complaints from the public. Tsai has also filed a complaint about his experience with the airline regulator — the Canadian Transportation Agency — a body he believes needs to crack down on airlines that violate passenger rights. "It's not about the money, it's just the principle now," he says. 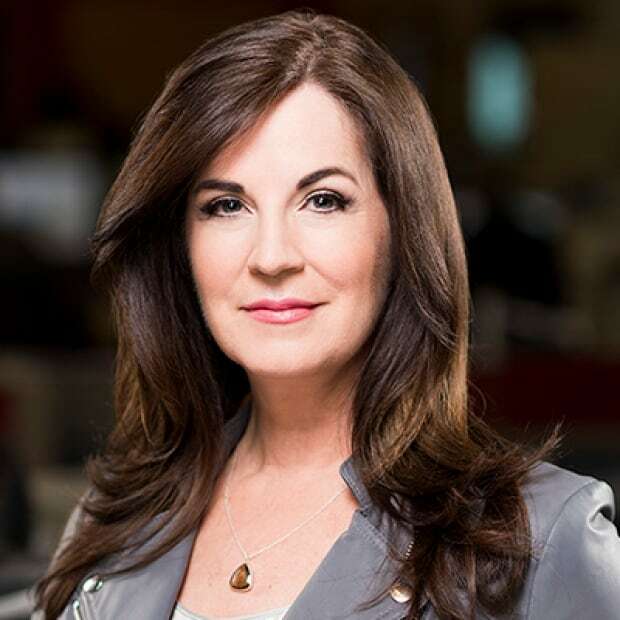 "I just really want to see airlines like Air Canada do a better job of handling their passengers."